The Scotland Malawi Partnership is proud to be supporting the implementation of the UN's Sustainable Development Goals in Scotland. Scotland was amongst the first nations to sign up to these 17 'Global Goals' which will fight poverty, climate change and inequality both in Scotland and across the world. The SMP is encouraging Government and Parliament to embrace the Global Goals. Every Party Leader in the Scottish Parliament has pledged support to the Global Goals for the Scotland Malawi Partnership. 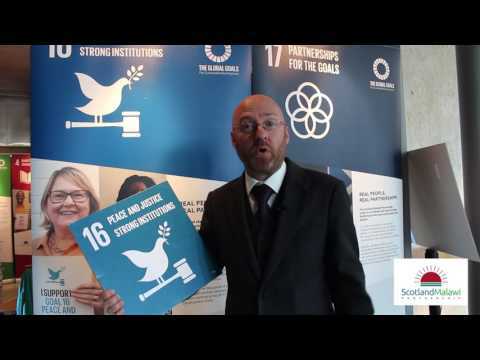 Around 100 of Scotland's 129 MSPs have chosen one Global Goal they will champion in Parliament for us. We accepted the UN's challenge to do a Dizzy Goal to help promote the Global Goals and, in turn, challenged then Minister for International Development, Humza Yousaf MSP. A great sport as always, he went all the way to Malawi to do his Dizzy Goal! The SMP has helped secure funding for SCVO to lead with the development of a national website coordinating Scotland's delivery of the Global Goals, a website where you can learn more about the SDGs in Scotland, find out how you can get involved, and share your own story. We've also developed a special pop-up exhibition made up of 17 banners, each one giving an inspiring case study of a Scotland-Malawi people-to-people link working towards each goal. The exhibition is free and available for any group in Scotland to use, to help raise awareness of the goals in their community. So far it's been exhibited at more than 50 events the length and breadth of Scotland, viewed by more than 10,000 Scots. The SMP is encouraging and supporting all our 1,000+ members to help deliver the Global Goals through their Malawi links. Click one of the 17 Global Goals below to find out what SMP members are doing in this area.